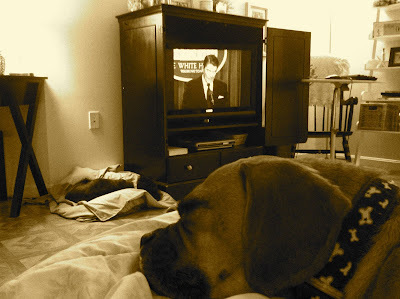 Brokaw and Princess snoozing on a typical Sunday afternoon, as we watch a documentary about President Reagan. This is our life lately. So, this is kind of like a Saturday morning post, except it's Sunday morning. But, it's Labor Day weekend, so it feels like today is Saturday. We got married on the Sunday of Labor Day weekend, you know. I got up early because the dogs needed to go outside and were hungry. I also don't mind the fact that I'm alone in the quiet, with only the sound of the laundry tossing around in the dryer. Brokaw's sleeping on a pile of clean clothes, natrually. I have freshly brewed coffee. Starbucks Breakfast Blend today. I thought I was too much of a "bold" girl, so I haven't gotten that in forever. But, Michael picked some up when the coffee was on sale at Target a few weeks ago. I started brewing it this week, and I'm reminded of how citruisy and fresh it is. Yumm. Oh, and it just so happens to go wonderfully with THREE pumpkin chocolate chip cookies for breakfast. M is still sleeping in the other room. I love him, but I love when he is asleep. Because then I feel so free and alone with my thoughts. I think it's the clearest time for my mind, and the best time to write. I've been thinking about writing a lot lately. I feel like it's something I'm supposed to do more of, so I'm trying to be more disciplined about it. I want to write a book. But, I'm not sure yet what it would be about. Our life? I don't know. I mean, it seems interesting enough for a blog, but a book? Hmm. We shall see, I guess. We haven't been to church pretty much all Summer. I know, it sounds like we are bad Christians, doesn't it? I've gone back and forth, feeling guilty about this, and feeling free about it. Why don't we go? Well, there is a list of reasons. I assure you, it's not a list of excuses, though. We miss it. We miss seeing our friends. We miss the worship time. We can still catch the messages online. I've been traveling so much for work, that when I am home, I am so tired. And, it takes a lot of effort to get Michael up, clean, dressed for the day, then make breakfast, and get myself clean and dressed for the day. Then, there's the effort involved in getting in and out of the car, which includes lifting a fully grown man twice. And, since I pulled my back a few months ago, makes me nervous, every. single. time. That's not to mention the wheelchair that Michael is in that is seriously on it's last leg. I worry about that constantly. The tires are crazy bald. If it were a car, it wouldn't pass an inspection done by a blind guy. So dangerous. So, there are a number of things keeping us at home lately. Hopefully, next week, we'll get the new wheelchair (we'll see. I'm pretty low on expectations from this medical supply company after MONTHS of haggling and waiting, and this, that, and the other). But, I travel three times in the month of September, then three times the month of October. Sigh. But, life is Good. God is working in our lives, individually, and together. Our marriage is strong, we like and love each other maybe more now than ever. We have community at work for me, and in the neighborhood for Michael. So, while we are missing out on church, God has provided for us in this season of slowing down, and being forced homebodies. I enjoyed your post and will pray for you two more often.